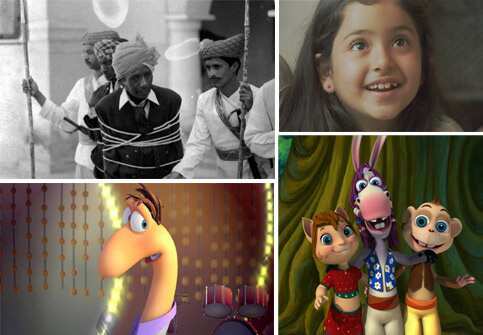 Cine Darbaar, a Delhi-based group of cineastes, in collaboration with the Children’s Film Society, India, is organizing the three-day Delhi Children Film Festival in the Capital from 20-22 October. Eight feature-length films in Hindi and English by film-makers such as Shyam Benegal and Santosh Sivan are scheduled to be screened. The films are Krish Trish and Baltiboy, Lilki, Chutkan ki Mahabharat, Karamati Coat, Halo, Sunshine Barry and the Disco Worms, Yeh Hai Chakkad Bakkad Bumbe Bo and Charandas Chor. An eclectic cast of characters surrounds Sasha, a little girl, as she wanders through the streets of Mumbai searching for her lost puppy who also lends its name to the title of the film, Halo (1997). The film by Sivan will be screened at 6.30pm on 21 October. Endearing: (Clockwise from top) Charandas chor; Halo; Krish Trish and Baltiboy; Sunshine Barry and the Disco Worms . Sunshine Barry and the Disco Worms (2008) by Danish director Thomas Borch Nielsen is an animated film about an earthworm’s attempts at making its presence felt. Watch what happens when it discovers an old disco record, igniting a desire in the earthworm to turn into the star of the world’s greatest disco band. This film will be screened on 22 October at 11am. Apart from the film screenings, Cine Darbaar will also organize workshops and review writing competitions. A highlight among these will be a workshop on the production of films for children and the tools required for it.